that is experienced as disturbing or threatening. Our primitive ancestors experienced stress when they had to fight off wild animals and other threats to their survival. Now, in the contemporary world, we are more likely to feel the anxiety that emerges from stress when we face overwhelming responsibilities at work or home, experience loneliness, rejection, or the fear of losing things that are important to us, such as our jobs or friends. When we are exposed to such events, we experience what has been called the fight or flight response. To prepare for fighting or fleeing, the body increases its heart rate and blood pressure. This sends more blood to our heart and muscles, and our respiration rate increases. We become vigilant and tense. Our bodies end up on full alert – and this allows us to take action. When these anxiety-inducing conditions continue over a long period of time, however, and have a significant impact on how we live, we may begin to suffer from one of the anxiety disorders. A nxiety can be helpful when it prompts us to take action to solve a problem. We can use our anxiety as a clue, in fact, that there is a problem, and that we need to confront it. Public speakers, athletes, and entertainers have long known that anxiety can motivate them to perform much better. When we don’t recognize our anxious feelings, or don’t have the tools to deal with them, we may continue to expose ourselves to the causes of the anxiety – and this leads to more problems. 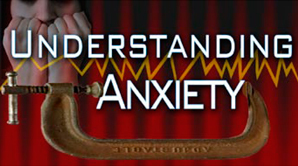 Prolonged anxiety is demanding on our bodies and our lives in general. The constant state of “fight or flight” may cause heart palpitations, dizziness, trembling or shaking, increased blood pressure, sweating, choking, high stomach acidity, nausea, chest discomfort, or muscle spasms. We may feel detached or out of touch with reality or think we are dying or going crazy. There is evidence that prolonged anxiety can lead to heart disease and a compromised immune system. It depletes our energy and interferes with concentration. We may become abrupt with other people and engage in emotional outbursts or even physical violence. Our relationships and job security may be jeopardized. People who experience prolonged anxiety are more prone to self-destructive behaviors, such as drug and alcohol abuse. An ability to define things positively is one of the main attributes of those who deal well with anxiety. The life process is one of loss and gain – it’s as natural as night and day. When we trust that our losses will give rise to new gains and life experiences, the anxiety and worry associated with loss need not be devastating. For example, the loss of a job can open the door to more satisfying employment and the opportunity for more fulfilling life experiences. The clue is to change our negative thoughts about situations into more positive thoughts – and positive feelings will usually follow a change in thinking. For example, if a close friend moves away, rather than thinking negatively about how lonely and devastated you will feel, think about the good memories you will always have, how your friendship will leave a positive legacy that will always touch your life, how you can still keep in touch and visit, and how you can now spend your time in new and positive pursuits. There really is no need for overwhelming anxiety in this situation. These dramatic episodes of anxiety seem to come out of the blue and happen even when there is no real danger. They are usually intense for a few minutes and then subside. The sufferer may experience chest pains, the feeling of smothering, dizziness, heart pounding, depersonalization, hot and cold flashes, sweating, numbness, or nausea. These symptoms may be accompanied by fears of dying, going crazy, and losing control. Those who experience panic attacks often live in fear of their next attack, and this may prevent them from leaving the house, being alone, or driving. Panic attacks are not triggered by a specific phobia. If you feel a panic attack coming on, it is helpful just to let it happen, as uncomfortable as this may seem. As is true of any phobia, you have to expose yourself to the feared situation in order for the fear to decrease over time. If you don’t tense up, the symptoms will generally subside within a few minutes. Tensing up will perpetuate the episode. You may feel faint, but you won’t really faint (blood is going to your muscles as you tense up and not to your brain, and this may bring on the sensation of fainting – but your blood pressure and heart rate have increased, so you’re actually less likely to faint). During a panic attack, try to rechannel your thoughts. Challenge your negative thinking (you are not having a heart attack; you will not suffocate; you are not going crazy; you will not die). Trust that this will end soon.